Our mission comes out of personal experience of caring, loving and traveling through a journey no parent ever asks to go with their child. Wylie Strotbeck is our inspiration. He entered our lives February 18, 1992. He was our joy. We called him Smiley Wylie. He was diagnosed with a type of brain tumor called a medulloblastoma in December of 2003 in the prime of his youth. This is the most common of all the childhood brain tumors, but not the easiest to cure. Through his struggle, we learned that thousands of children suffer through this diagnosis, harsh treatments and often loss of life, every year. The journey is cruel and it is the mission of the Wylie’s Day Foundation to fund cutting edge Pediatric Brain Tumor research towards the DAY when no child needs to suffer from this disease. The foundation also supports programs at Children’s Hospital of Philadelphia, Oncology Child life department. About Wylie~ Thirteen years is not a very long time to live, but that is what Wylie Strotbeck was given. It was a very rich and loving life, but far too short for any child. While visiting family in Colorado, Wylie was diagnosed with a PNET brain tumor. He was skiing and was suddenly overcome with head pain so intense, he needed to be brought down the mountain by sled. Wylie had suffered migraine headaches from the time he was 5 years old, but they were infrequent, never accompanied with other symptoms and an MRI in 2nd grade revealed a perfectly normal brain. The migraines were purely coincidental and totally unrelated to the tumor up until a few months before the diagnosis. The headache subsided, but returned the next morning and Wylie was taken to a small hospital in Steamboat where a CT scan was ordered. The doctor’s look said it all. This was serious. He was air-lifted that morning to Children’s Hospital in Denver and flown back to Philadelphia the next day. Wylie’s diagnosis required immediate surgery, followed by 6 weeks of intense radiation and chemotherapy. During the 1 _ year battle with this tumor called a medullablastoma, Wylie needed to have his stem cells harvested, surgeries to implant devices to administer medications and numerous blood transfusions. Complications rose from a beaten immune system. Who needs shingles and sinus surgery when they already have a brain tumor? All treatments were performed at Children’s Hospital of Philadelphia. The nurses and doctors could not have been kinder or wiser. All this time, Wylie attended school whenever he was able and was home schooled when he could not physically be with his class. He demanded a certain level of excellence from himself and did not want to repeat a year of school. He also continued to play soccer and baseball, using a runner when needed and ducking out to throw up when the effects from the chemo were too nauseating. 9 months after diagnosis, Wylie’s scan of his brain appeared clear of tumor. Everyone was very optimistic although we knew the incidence of reoccurrence was huge unless we administered one final blast of high-dose chemo which was very risky and would wipe out the entire immune system. Before the procedure, it was necessary to have another MRI. Much to everyone’s concern and horror, the tumor had returned. This rarely occurs mid-treatment. High-dose was now out of the question. Experimental therapies were all we had left. From Jan 2005 to April 16, Wylie fought bravely for the life he loved. His enemy was unyielding. We brought Wylie home from Children’s Hospital one last time, promising him he did not have to go back. For the last 6 weeks of his life, we were able to care for Wylie, surround him with loved ones, and bring him into the sunshine. He died in our arms on April 16th. 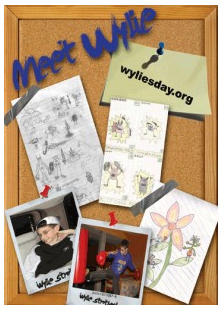 Donations received through Wylie’s Day Foundation will allow us to fund cutting edge research and expedite clinical trials so that one DAY no child will suffer from this cruel and difficult journey. Brain tumors are the most common solid pediatric tumor. Currently, there are over 2200 new cases of pediatric brain tumors diagnosed every year. Survival rates vary upon tumor type, but average 55%. These statistics have not risen in 30 years.